Layer by layer, I put them on the pan. The first layer, then I applied tomato pasta with the minced meet and smoked beef. Ups, I didn’t forget to give oregano leaf into it once cooked. Next, again, I put another layer of lasagna, which previously boiled, in which I mixed some spoons of oil into the water so they wouldn’t stick together. I added creamy sauce, made of low fat milk that I cooked with cheddar cheese and pepper powder. It was just like making creamy soup where I fried flour with the butter. 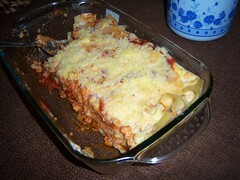 Okay then I put another layer, then laid the tomato pasta, the creamy sauce, consecutively until the tray was full. Finished with the layers, I prepared the oven, turned it into 150 degree. I took the pan into the open and set the timer. It was around 30 to 45 minutes. I saw the the topping, which was full with chess, melted. And the good smell came around. It was just baked perfectly. But I couldn’t taste it directly as I had two guests to be the first taster. Not long after that, the awaited guest came. I served the pan and let them tried first. Nervous, I expected their comment. Then I stared to my hubby. Okay hunney. Then I left half of Lasagna with him. “I got drunk because of your lasagna. It’s just really delicious”.